Because sometimes, you need a new perspective. Sometimes upside-down provides the best view. Sometimes it’s good to focus on the tiny, beautiful things. And sometimes, you just have to be silly. Things have been busy, busy around here, graphics work and gardening and trying to get new jewelry and photography loaded into the etsy shops. It’s a full life, this being an artist. That’s why, every so often, you just have to get down on the ground and look at things in a fresh way. 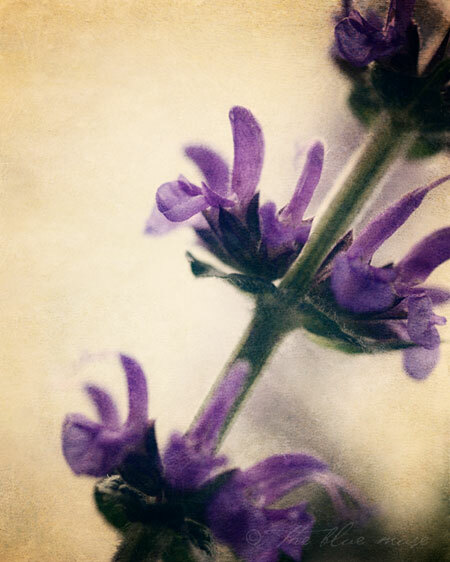 These salvia flowers look completely different from a distance, from above. But I have to say, I kind of like the way they look from this angle best. Wishing you a week filled with wonderful views.